I made these chocolate cupcakes for my daughter's rainbow themed birthday party. This recipe is gluten free, egg free and corn free. These cupcakes also freeze well. Recipe adapted from here. Preheat the oven to 350ºF. 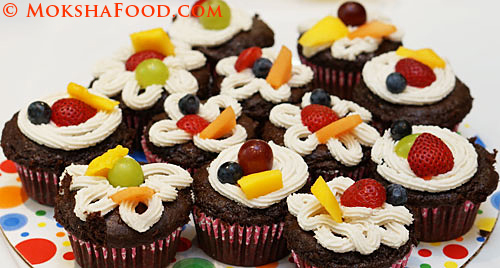 Line a 12-cup cupcake pan with paper liners. Add in the milk, egg replacer, oil, vanilla and vinegar. Beat the batter for a full two to three minutes until all the ingredients are incorporated and the batter is smooth. Plop the batter into the paper liners till they are almost 3/4 full. Bake in the center of a preheated oven till done- about 20 minutes or so. Test with a toothpick. Frost when completely cooled. I used simple buttercream frosting and fresh fruits. *This recipe can easily be converted vegan by replacing the milk with coconut or almond milk.